Okay, I lied right from the start with that title. Don't get into thinking that you can get any real security out of this, as it is equivalent to a locking screensaver. In fact, this is just a screensaver add-on for GNOME. That said, it does prevent the occasional hyperactive child or devious coworker from messing with your desktop when you are away and forget to lock it. Basically, this is proximity-based access for your computer. If you're the type who forgets to lock your desktop, then this is for you. All you need is Bluetooth support on your desktop or laptop, a Bluetooth-enabled device, and BlueProximity. 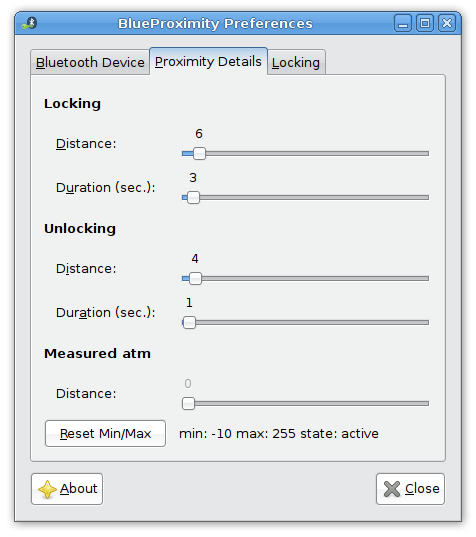 BlueProximity monitors any Bluetooth device paired with your system for signal strength. When you walk away from your PC, the signal strength will drop and your screen will lock. When you return, your system will be ready for you again. As long as you have it running, it will idly sit in your system notification area and take action when you leave your desktop or return. The settings are preconfigured for a GNOME's gnome-screensaver, but they can easily be redone for KDE or XFCE screensavers. Once you have your distance settings set up (the defaults work in most cases) you can activate it by simply walking away from your desktop with your Bluetooth device. If you add it to your session startup, it will always be around.